44 min 17 sec ago. 59 min 8 sec ago. On Oct. 23 of last year, Senate Majority Leader Harry Reid wrote two letters. And so began a nine-month lobbying effort that took almost a year, led by Sandoval’s economic development czar, Steve Hill, and his impressive team, but intermittently boosted by personal interactions with Musk by Reid and especially Sandoval. The deal nearly fell apart four or five times, according to sources familiar with the negotiations, as Musk’s “pay and you can be my pal” approach” actually resulted in one demand a couple of months ago for $500 million up front (in addition to all the abatements), which is slightly less than one-fifth of the state’s annual general fund budget. Sandoval flatly rejected such an idea. Reid’s loose and occasionally destructive lips were not helpful in August when, despite the sensitivity of the ongoing negotiations that included this game of brinksmanship, the majority leader suggested Musk might be “playing” Nevada and that Reno should not count on those 6,200 jobs. Maybe he was trying to nudge the direct-subsidy-demanding CEO, but I’m sure Musk was thrilled to hear that. After a few weeks of back and forth, with both sides representing their constituents (stockholders and voters) the state persevered. Musk’s desire to come to Nevada was clear, resulting in the momentous announcement last week in Carson City in which Sandoval announced before a throng of hundreds on the Capitol grounds that Tesla was bringing the gigafactory to Northern Nevada, reserving a special gushing shout-out during his speech for Reid, who was at that clean energy summit in Las Vegas. Considering the political backdrop of Reid trying to prevent Sandoval from running against him and both men heavily involved as a result in the race for lieutenant governor, their symbiosis is but one aspect of a remarkable story that could forever change Nevada’s brand (Sin State to Clean Energy State? ), one that raises questions about how large a gamble this is for Nevada (a 10-figure giveaway package and cosmetic contributions by Tesla to education) and Musk (the future of lithium batteries) and one that could cement legacies for two men in the most unlikely of partnerships. How this occurred and what it means are part of a story that has no final chapter yet, especially with the Gang of 63 about to weigh in on Wednesday. And it is a story replete with only-in-Nevada aspects, especially a brothel owner (Lance Gilman, who runs the site) ironically critical to the rebranding effort from sin to renewables, helping a senator who wants to outlaw the cathouse business and ensuring a governor’s immense popularity will make him sought after by national Republicans in two months time to run against Reid. The Tesla victory also has aligned the far left (PLAN) and the far right (NPRI), who have spoken up publicly and privately about the corporate welfare, while sowing the seeds of North/South dissension, even though the factory will be an economic boon to the entire state and Musk could not have located the facility in the South. Here’s how it happened, courtesy of various insiders familiar with the negotiations who would not talk for attribution because the Legislature has yet to finalize the deal, and what it could mean. Tesla has been on the cutting edge of renewable technology and government handouts since it first opened in 2008. Nearly five years ago, it received a Department of Energy loan guarantee to build its California facility. Musk paid it back nine years ahead of schedule, showing how the loan jumpstarted the company and gave it the opportunity to consider its massive expansion and mass production of electric cars. For those who still revile the stimulus package, consider, too, that Tesla took advantage of an electric vehicle tax credit, which was expanded by the American Recovery and Reinvestment Act. And that stimulus also included $2 billion for manufacturing advanced batteries, with $28.4 million going to a Nevada company called Rockwood Lithium in Silver Peak. 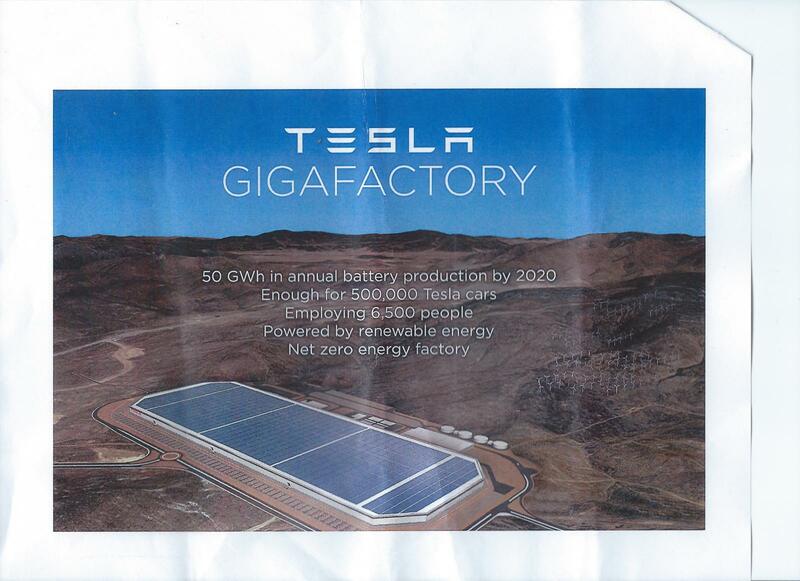 Rockwood is the only operating domestic lithium mine in the country, leading many to believe that is why Musk targeted Nevada for the gigafactory. Indeed, it may have played a role, but I am reliably told that it was not as critical as one might think. One knowledgeable source told me it is "not a high-cost component, not even a medium-cost component” of the deal, that it would not be that expensive to transport lithium for the batteries. “It was not a consideration,” the source said. But Nevada’s proximity to the California factory and the different approach to regulation and tax benefits than California were. As Economic Developoment Authority of Western Nevada boss Mike Kazmierski said on "Ralston Reports" and as others have told me, it was not just “time of execution,” as Musk put it, but “risk of execution,” as one of the key players said. “The attitude is how can we help you overcome obstacles that are real and remove obstacles that are not,” one source said. That all but eliminated California but made Texas, where Gov. Rick Perry loves giveaways, the top competitor. Reno is much closer to Musk’s headquarters than anywhere in Perryland, so that and the alacrity with which Musk could begin building (they are moving ground already) outweighed the much larger benefit packages Perry could offer. Sandoval inserted himself into the negotiations several times, and Reid made calls. In December, Reid called Musk after the governor's office asked him to leverage his relationship with the Tesla boss and then he called Sandoval to update him. Reid would make other calls to Musk during the process, including one in March. During the spring, Sandoval asked Reid’s office for assistance in securing the right of way that might be needed for the gigafactory. The negotiation proceeded apace, with some (including Reid) suggesting Musk was pitting one state against another smply to up the ante. And, of course, he was. If any business could do the same, it would. Ultimately, state officials decided gutting a film tax credit worth $80 million and ending an insurance home office tax credit worth $125 million, neither in good favor with the economic development team, was “the limit of what we could do," as one put it. And that, it turned out, was enough for Musk, who received anywhere from $600 million to twice that depending on whether the 6,200 jobs and the build-out actually come to fruition. In the end, the state’s proximity , the site’s closeness to an interstate and rail line and a low-tax state offering to abate all taxes for a long time proved irresistible for Musk. The deal actually was consummated Tuesday evening but was still closely held. On Wednesday, Sandoval began briefing legislative leaders, who then informed their caucuses, which are tantamount to political sieves. Word of the deal began to leak, and local and national media were soon reporting Nevada had landed the facility. But the mystery already was gone. The 4 PM Thursday news conference’s subject was obvious; all that remiend was the choreography. Ninety minutes before the extravaganza began on the Capitol steps, with word already out that Musk would be there (he flew in from London), dozens of chairs were set up and Assemblyman Randy Kirner and his wife were already there. An hour and a half later, all of the seats would be taken and dozens, if not hundreds of people would be standing behind them, arrayed in a semicircle to listen to what was about to be announced. After Sandoval outlined the putative benefits -- $100 billion to the state’s economy and a 20 percent-plus to Reno's – and downplayed any of the giveaways (he barely mentioned them), Musk spoke about the ability of Nevada to move quickly. He actually said the incentives were not nearly as critical as the “time of execution,” which drew the line of the day from Steve Hill when he came to the podium. "This is the first time I've heard incentives aren't the most important thing,” he joked to much raucous laughter. There were several standing ovations during the news conference, which seemed slightly creepy since most of those who were jumping to their feet had had no time to analyze the deal. No one can deny that this agreement, which surely will be ratified by the Legislature, could change the state forever. But it seems premature to compare it to the Comstock Lode or the legalization of gambling as watershed moments. This is, as the New York Times’ Matthew Wald pointed out, a huge gamble on both sides. But despite the silliness likely to suffuse Carson City on Wednesday (and maybe Thursday and maybe Friday), this seems like a gamble the gambling state had to take. Nevada has performance-based incentives, which Speaker Marilyn Kirkpatrick has made one of her signature issues, and she will make sure the policy is right. Or as right as it can be. The ineffable benefit of changing the state’s image, of rebranding Nevada as a place high-profile businesses want to come as opposed to a place where tourists want to let their hair down or where the feds want to stick their nuclear waste, is not to be scoffed at. Yes, the incentives package should be debated, especially the direct transfers of money to buy the right of way and give transferable tax credits. And the contributions by Tesla to higher and lower end are relatively minuscule (one source call them "insulting") -- $1 million to UNLV for battery research and $37.5 million to lower ed starting in 2018 (!) -- will look to some as lipstick on a pig. But despite the wailing from NPRI and PLAN that the deal is too generous or the pathetic mischief-making from southern partisans who simply want to cause trouble, the deal will go through, even if there are a few bumps along the way, as there always are in the Legislative Building. As I walked away from the Capitol on Thursday afternoon, I ran into state Senate Minority Leader Michael Roberson, who along with all legislative leaders had been on stage with the governor and Musk. He was wearing a Tesla pin.